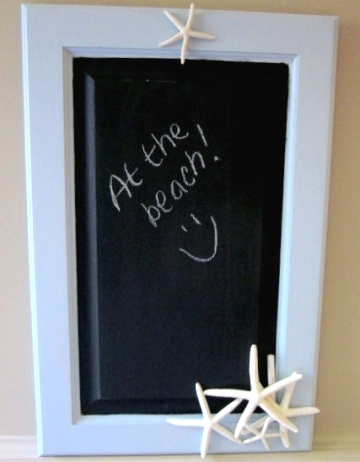 Message chalkboards come in very handy when you want to let everyone know you went to the beach, or simply leave a sweet saying that puts a smile on everyone's face. 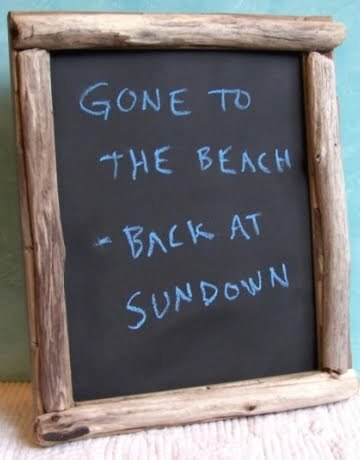 A pretty chalkboard beach sign seen at Style Me Pretty. 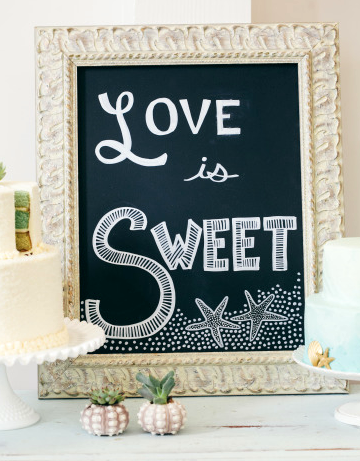 Place your chalkboard sign where everyone can see it, and you're good to go. Seen at BHG. A lovely idea too. A decorative message chalkboard with a driftwood frame. Original source no longer available. Sue at Uniquely Chic saved a cabinet door from her kitchen remodel and turned it into a decorative Message Chalkboard. If you deliver the message in style, nobody will mind the pile of laundry. 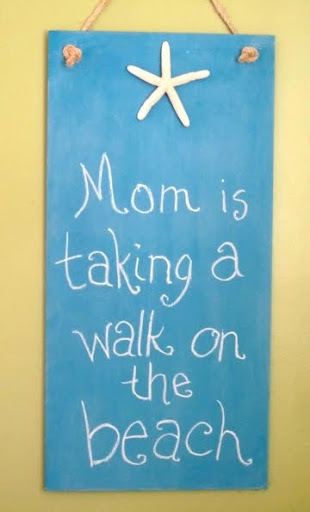 Every Mom needs a Chalkboard Sign like this. You might have noticed, chalkboard paint has taken the craft and DIY world by storm and comes in many different colors. Some folks even mix the paint up themselves. All you need is plaster which is very inexpensive. 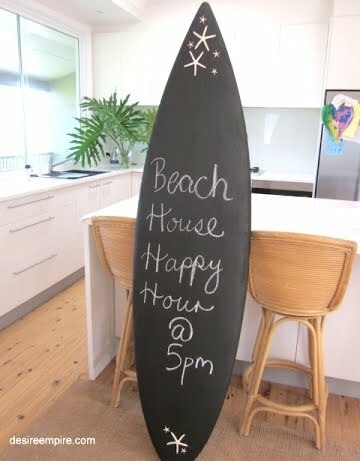 Surfboard Decor with a chalkboard sign via Desire Empire. 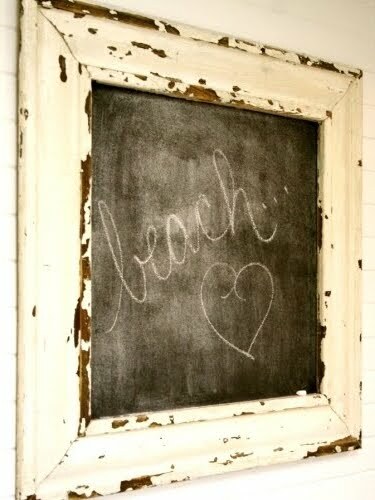 A perfectly beachy white Chalkboard Message Door seen at a Beach Cottage. 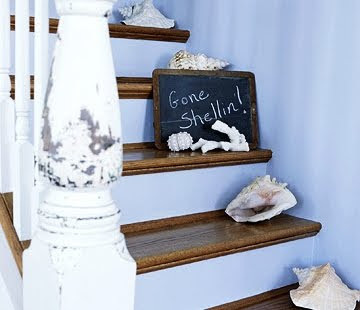 This shabby chic chalkboard beach sign hangs in a lovely Florida Beach Cottage. 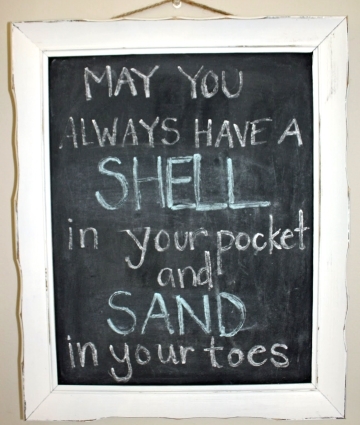 May you always have a shell in your pocket and sand in your toes. Via Pinterest.